When a commercial truck, especially a large container truck, is involved in a vehicular accident on a freeway, the effects can be devastating. These vehicles are large and heavy, lack maneuverability and are slower to stop than lighter weight cars and trucks. Plus, long working hours for most commercial vehicle drivers can make an accident more likely. And because of the sheer size and weight of the vehicles involved, the accident is more likely to cause severe injury or death. Physical injuries resulting from these accidents can include fractures, herniated discs and other similar injuries. Many of these injuries require surgery to repair the physical damage. In addition to your physical injuries, you will have medical bills, lost wages, property damages and other damages. It can seem overwhelming to deal with your health care and the legalities of an accident like this. But with good legal help, you can not only heal, you may be able to recover damages for your accident. 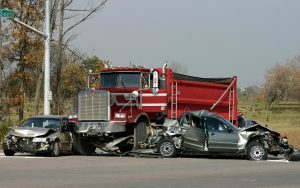 You need the help of an experienced Okmulgee truck accident attorney. Accidents always have a cause. There is always a reason – or multiple reasons – for an accident like this. Your Okmulgee truck accident attorney has experience and training in determining how and why an accident occurs and who bears legal responsibility. You want someone in your corner at a time like this. The number of truck accidents has increased in the United States in the past two decades. The Federal Motor Carrier Safety Administration (FMCSA) estimates that 4,897 people died in 2002 and 130,000 people were injured in crashes that involved a large truck. A wide variety of laws cover an interstate trucker; everything from how long a shift is to regulating breaks. These are covered by federal law. A truck driver is also subject to the traffic laws of the state it is passing through. This can make it difficult to ascertain exactly who is at fault. Sometimes, drivers’ records must be obtained in order to determine if driver error caused the accident. The FMCSA’s recent Large Truck Crash Causation Study found driver performance, including error, to be the reason in nearly nine out of 10 crashes in which the truck was the primary cause of the accident. Driver error can occur if the driver is driving too fast for the road conditions, was driving while distracted by a cell phone or while eating, or was distracted in another way. It can also occur if the driver was overly tired, improperly loaded the truck such that the driver lost control when the load shifted, or if the driver was under the influence of any drug or alcohol. But liability may also lie with the owner of the truck if there is a mechanical problem with the truck, such as brakes failing. Liability can even extend to manufacturers of the truck’s mechanical materials if they are involved in the accident. Thus, a number of defendants may be involved in the settlement of your case. And each of those defendants carries liability insurance. Whether the accident involves a semi, or other type of truck, the questions regarding liability must be resolved in your favor before you can collect damages. And for this, you will need the help of an experienced Okmulgee truck accident attorney. Most of these cases are premised on a theory of negligence. That theory espouses that a truck driver has a duty to exercise reasonable care in driving. If they fail to do so, and that failure is the legal cause of the accident, then you can form a case for negligence. Most of the issues of proof center on those three elements. This proof can come from the driver logs, maintenance records for the truck, and eye witness testimony. Expert witnesses may be required to establish a company’s duty and how commercial transportation companies in the industry typically meet those duties. You need the help of a good attorney to get the documents that can prove liability. Sometimes, these records can be obtained before a lawsuit begins, but more often, they are available through the discovery process of a lawsuit. You want to make sure that you get the settlement you deserve. All too often, a claimant will accept an insurance company’s first settlement offer. That may be a costly mistake. It could be that your medical treatment and bills are not complete. As bills come trickling in after you accept the settlement, you will have to pay those out of your own pocket. Better to have an attorney negotiate a full and fair settlement for you that takes all of your damages into account. Wirth Law Office – Okmulgee’s truck accident attorneys typically receives no payment until the case is settled. You are also paid once the case is settled. Get the help you need. If you’d like a confidential, no cost consultation with an Okmulgee truck accident attorney, call (918) 756-9600 or toll-free (888) Wirth-Law for a free consultation at the Wirth Law Office – Okmulgee. Or, enter your legal question or concern in the firm at the top right of this page, and one of our attorneys will email or call you.